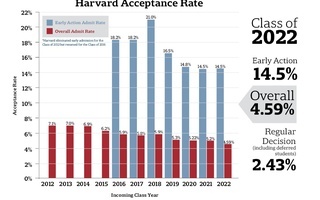 A record-low 4.50 percent of applicants to Harvard College received admissions offers to the Class of 2023, with 1,950 of 43,330 candidates securing places in the class. The College notified 1,015 students of their acceptances in the regular decision cycle at 7 p.m. Thursday evening. They join 935 applicants admitted through the College’s early action program in December. This year’s admissions rate is the lowest in College history, down from 4.59 percent last year. This year marks the fifth consecutive application cycle in which the percentage of accepted applicants has decreased. 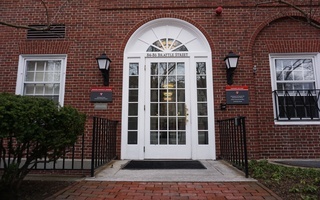 The total number of admitted students in the Class of 2023 has also decreased slightly from last year’s 1,962. The admitted class includes six veterans and 41 students who indicated an interest in ROTC, an increase from previous years, according to Fitzsimmons. In comparison, the Class of 2022 included just one veteran and 30 students interested in ROTC. In addition, 650 admitted students — roughly a third of the class — indicated interest in pursuing community service as an extracurricular activity. The percentage of Asian-American admits increased to 25.4 percent, from 22.7 percent last year — the first time a non-white racial demographic has exceeded one quarter of the admitted class. The percentage of Latinx admits increased to 12.4 percent from last year’s 12.2 percent while the percentage of Native American and Native Hawaiian admits increased to 2.6 percent, up from last year’s 2.4 percent. The percentages of African-American admits and first-generation college students decreased by 0.7 and 0.9 percentage points, respectively. The admitted class is 14.8 percent African American and 16.4 percent of the admits will be the first in their families to attend college. 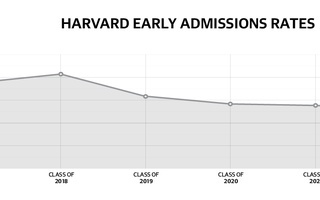 These demographic shifts come amid an ongoing lawsuit brought against Harvard in 2013 by anti-affirmative action advocacy group Students for Fair Admissions that alleges the College’s race-conscious admissions policies unlawfully discriminate against Asian-American applicants. The case went to trial in October 2018; Judge Allison D. Burroughs is expected to release her ruling sometime this year. “As it turns out, there was an increase in the number of Asian-American applications as well, and that’s something we would expect literally over the next generation,” he said. Fitzsimmons also said the scrutiny that personal ratings — numerical scores assigned to Harvard hopefuls that evaluate them on qualities like humor and grit — have received did not affect admissions results. “The fundamental principles of how we evaluate applications has not changed for a very long time, and did not change this year,” he said. Every state and 89 countries are represented in the admitted class, with the percentage of international students rising 0.3 percentage points to 12.3 percent of the admitted class. Approximately 21.7 percent of admitted students come from the mid-Atlantic states, 19.6 percent from the South, 17.3 percent from the Western and Mountain states, 16.6 percent from New England, 11.8 percent from the Midwest, and 13 percent from the U.S territories and abroad. Women and men are equally represented in the incoming class, at 50 percent each. Current projections from the Financial Aid Office suggest more than half of the Class of 2023 will receive some form of need-based financial aid, with an average family contribution of $12,000. Projections suggest that 20 percent of the class — students whose families have an annual income of under $65,000 — will not be required to contribute to the cost of attendance. Those students will also receive a $2,000 start-up grant to help with move-in costs and other expenses. Along with their acceptance letters, admitted students will receive an invitation to Visitas — the College’s visiting weekend for accepted students — which will last from April 27 to April 29. Students have until May 1 to accept, defer, or decline their offers of admissions. A previous version of this article incorrectly stated the average grant to families receiving need-based financial aid is $12,000. In fact, $12,000 is the average contribution families on financial aid make towards enrollment costs. —Staff Writer Camille G. Caldera can be reached at camille.caldera@thecrimson.com. Follow her on Twitter @camille_caldera. —Staff Writer Sahar M. Mohammadzadeh can be reached at sahar.mohammadzadeh@thecrimson.com. Follow her on Twitter @saharmzadeh.